Individual practice will vary. Your surgeon will be able to explain what will happen toyou. In most cases surgery isperformed under a general anaesthetic, which means that you will be asleep forthe operation. In many cases theanaesthetic doctor will also recommend an arm block, an injection around theshoulder to temporarily prevent the nerves in the arm from carrying painsignals to the brain. The aim ofthis bock is to lessen the post-operative pain in the elbow but it will alsohave the effect of temporarily paralysing the arm on the day of the surgery. Your surgeon will usually make a cut on the back of theelbow to remove the damaged elbow and implant an elbow hemiarthroplasty. After the surgery you will have abandage on the elbow and you may also have a splint to rest the elbow. 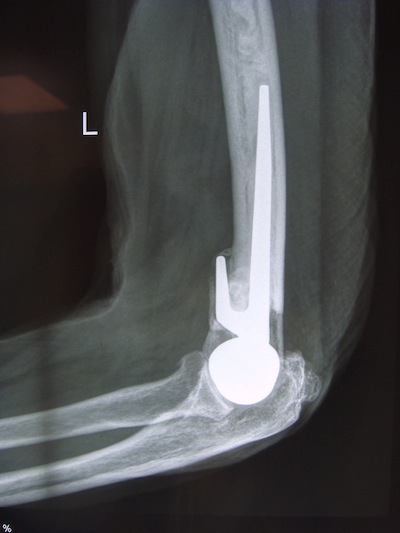 Most surgeons will aim to move theelbow as soon as possible after the surgery to reduce stiffness. Resting splints may be used for severalweeks, especially at night. Physiotherapy is recommended after this type of surgery. You can expect to stay in hospital for between two and fivedays. The aim of elbow replacement surgery is to give you a painfree, mobile elbow that enables you to perform normal everyday activities. It is recommended that after thissurgery the arm is not used to carry heavy objects or for heavy manualactivities as these may lead to early failure of the replacement. The risks of this surgery can be divided into the risks ofthe anaesthetic and the risks of the surgery itself. Your anaesthetic doctor will be able to advise you of therisks of the anaesthetic. The risk of infection is probably the same as for total elbowreplacement with a risk of approximately 2 out of 100 cases within one year ofsurgery. Late infection can occurand increases the overall rate up to 5 in 100 cases. If the elbow replacement becomes infected it is most likelythat it will have to be removed in order to get the infection under control. This means that the replaced part of theelbow move out of position so that it does not join correctly with the nativepart of the elbow. This is oftenpainful. Surgery may be needed to put the elbow back into position withoutopening the elbow (manipulation under anaesthetic, MUA) or by an operation toopen the elbow and join the two parts together. Occasionally revision surgery may be required. 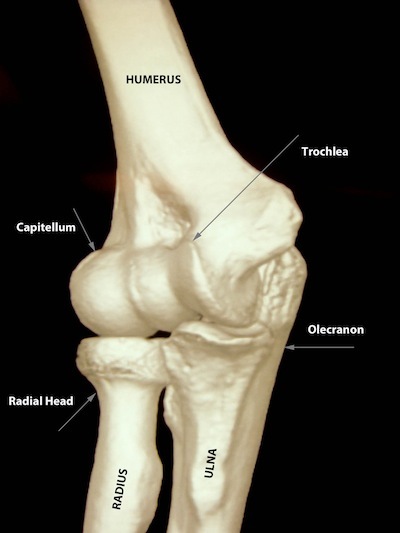 The bones around the elbow may break(fracture) either during the surgery if they are very fragile or after surgeryas a result of the elbow replacement loosening in the bone or after afall. Further surgery may beneeded to address this. The nerve that is at greatest risk ofinjury is the ulnar nerve. Thisnerve passes around the back of the elbow joint and supplies the feeling in thelittle and ring finger and also some of the muscles in the hand. If this nerve is injured you mayexperience pins and needles or numbness in the little finger or weakness inthe hand. These symptoms usuallyrecover but may be permanent. The elbow replacement is usually fixed intothe bone using a cement that acts like the grout on wall tiles. 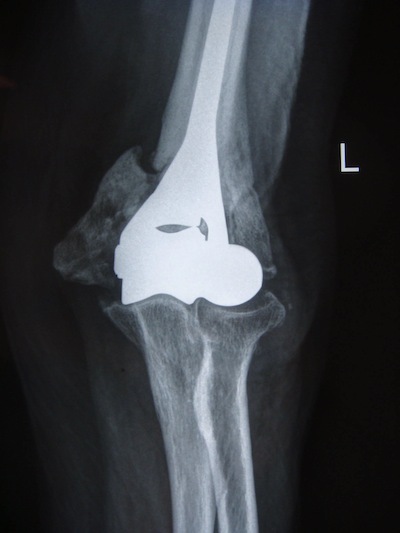 With time the replacement may becomeloose in the bone which can lead to pain or fracture of the bone. Your surgeon will usually monitor yourelbow replacement after surgery with X-rays to look for signs of thisloosening. If the implant becomesloose your surgeon will usually recommend surgery to revise the elbowreplacement. If you have any questions about your operation you shouldask your surgeon for more information.